Student exchange programmes and study visits among universities are becoming more popular and are also becoming an integral part of a university’s education. Many universities across the globe have initiated student exchange programmes, visits and study tours which are intended to increase the participants’ understanding and tolerance of other cultures, as well as improving their language skills and broadening their social horizons. 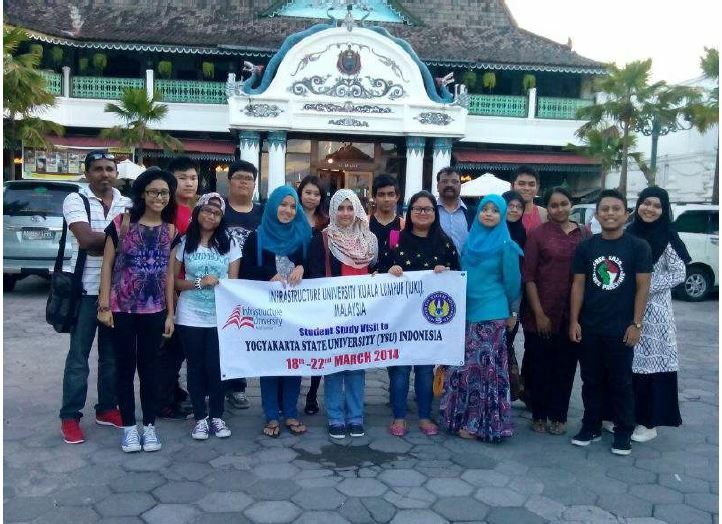 Study visit to Yogyakarta State University, Yogyakarta (YSU) was held on 18-22 March 2014. This four days study visit was participated by five Bachelor Degree students from Faculty of Business and Accounting and eight Diploma students from Faculty of Arts, Communication and Education and a student from the Faculty of Applied Science and Foundation Studies accompanied by two lecturers. Exposure to different educational systems and culture will enrich our students with rich experiences hence enhancing their status as quality graduates for a better tomorrow. As participating students will be directly involved in the planning and organizing of the proposed programme, they are expected to gain management and organizing skills in the process. Just like lessons and classroom discussions, the learning experiences in real life situations will have a large impact on a student’s knowledge. A study trip, especially the one that involves foreign countries, will provide them with the opportunity to meet people of different backgrounds, and the interaction and conversations they have with them will certainly challenge them and their perspectives. Students, particularly at tertiary level should be allowed and encouraged to take advantage of study tour opportunities to experience language immersion to sharpen their social communication skills as well. Among the best places to visit abroad are those where students must step outside their comfort zones by having to navigate another culture in a foreign language as in the directions of the two successful study programs conducted by IUKL. In the one week study programs, students had the rare opportunity to experience classroom lectures in a foreign university environment, had dialogue sessions with lecturers and student representatives, and participated in co-curricular activities.